Alaska is known around the world for its variety and quantity of top-quality fishing opportunities. With literally dozens of freshwater and saltwater species available, it truly is an angler's paradise. But where to you begin? The state is twice the size of Texas, with many and diverse ecosystems, each offering something different from the last. The intent of this page is to assist you in sorting it out. There are several approaches to finding a great fishing destination in Alaska; it all depends on what you want. If you're looking at a quick day or weekend trip, a regional approach might be the most effective. 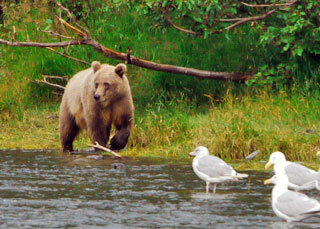 Simply investigate the opportunities in the area of Alaska where you will be. Another approach is to look at certain species you might want to target. Most of Alaska's freshwater and saltwater species do not have statewide distribution. That means you need to know where your species of choice is found, and start your planning there. Finally, if you're planning an extended trip of a week or more, it might be easiest to list the other elements of your trip and choose the species and options that best fit your needs. Let's look at all three methods in more detail. Alaska is the largest state in the United States, and for purposes of planning your fishing trip, you must break it down into manageable pieces. This site divides the state up into the same five regions used by the Alaska Department of Fish and Game's Division of Wildlife Conservation. Though some of these regions are quite large, each presents similar species, conditions, access requirements and other things that draw them together and make planning a trip that much easier. You can find all of Alaska's regions listed under the "Places" menu. Each of these pages lists the physical characteristics of the area, available species, and fishing opportunities. Additionally, we have pages on the site devoted specifically to fishing opportunities in each area. The Alaska Panhandle offers both freshwater and saltwater fishing opportunities. Most of the river systems here are short and bordered by deep, virgin stands of timber. Access can be difficult, but they offer outstanding angling opportunities for all five of Alaska's salmon species, plus steelhead, rainbow, cutthroat and brook trout, along with Dolly Varden, grayling and kokanee. Saltwater anglers will see outstanding trolling or mooching opportunities for salmon, and bottom fishing can be excellent for halibut and several species of rockfish, along with ling cod and more. Southcentral Alaska and the Kodiak-Afognak island group provide the best road access, and some outstanding angling opportunities for king salmon, sockeye salmon, pink salmon, silver salmon and chum salmon, which can be had in both freshwater and saltwater environments. Steelhead are available, along with rainbow trout, lake trout, grayling, Dolly Varden, burbot and northern pike. The saltwater fishery is very active and there are more than enough opportunities to fish for rockfish, halibut, ling cod, pacific cod and many more species. The eastern arctic and the interior provide freshwater opportunities for lake trout, rainbow trout, Dolly Varden, grayling, northern pike and burbot. Salmon fishing is limited to river opportunities for kings, reds, silvers and chums, and saltwater fishing is restricted to the northeastern shores of the Arctic Ocean, where sea-run Dolly Varden can be caught from the beach. There is no saltwater charter fishery here. Bristol Bay through the Alaska Peninsula and the Aleutian Islands area offers some of the best trophy rainbow trout fishing in the state, along with lake trout, grayling, northern pike, Dolly Varden and some of the largest salmon runs in the state. Saltwater fishing opportunities are very limited when it comes to charter fishing, however there is some excellent charter fishing for halibut out of Dutch Harbor. Farther out in the Aleutians, Adak offers unique freshwater angling for sockeye and silver salmon, along with shore-based surf fishing opportunities for rockfish and halibut. Offshore fishing is impractical here, due to the lack of commercial charter outfits, however it is possible to ship an inflatable sport boat and motor out via air cargo, and on a calm day you could do some halibut fishing, or jig the rocky shoreline for rockfish and rock greenling, which live there in abundance. The western Arctic, and the Yukon / Kuskokwim Delta offer two completely diverse ecosystems which must be separated for discussion purposes. The northern part of the region straddles the Arctic Circle and offers freshwater fishing for sheefish, burbot, grayling, northern pike, Dolly Varden and whitefish. Saltwater fishing opportunities are very limited, as there are no commercial charter operations. The southern portion of the region, the Yukon / Kuskokwim Delta, offers northern pike and grayling, rainbow trout, along with king, chum and silver salmon. The main salmon corridors are the Yukon and the Kuskokwim, where shore fishing opportunities are very limited. Saltwater fishing is very limited due to a lack of commercial charter operators. All in all, fishermen in Alaska are in for opportunities on a scale unparalleled elsewhere. Whether you're after big-game on the saltwater, hard-fighting salmon and large trout in the rivers, or quietly paddling a lake or stream in pursuit of relaxation, it's all here for you. The following tools are the minimum "must-haves" for Alaska fishermen. Alaska Fishing, by Gunnar Pedersen and Rene Limeres. Covers the entire state, freshwater and saltwater, including locations, tackle and terminal gear for each of Alaska's species. The Highway Angler, by Gunnar Pedersen. If you're fishing the road system, you need this book! It walks you through all the species, gear and precise locations and timing of Alaska's roadside fisheries. Flyfisher's Guide to Alaska, by Scott Haugen. A comprehensive overview of flyfishing all regions of Alaska, including the gear needed for each species. Includes popular fly patterns. Fly-Fishing for Pacific Salmon II, by Les Johnson and Bruce Ferguson. A great book featuring popular saltwater flies and techniques for Alaska's salmon. Be sure to check out our Cookbook Section in the bookstore, for cookbooks for your take-home species. If you're looking for a particular species, you'll be pleasantly surprised at the variety Alaska has to offer. Check out our growing collection of species-specific pages to learn about the habits and locations of Alaska's fish species, along with the tackle and techniques to catch them! Alaska has five species of salmon, steelhead, Dolly Varden, Arctic Char (a close relative of the Dolly), brook trout, cutthroat trout, rainbow trout, lake trout, kokanee, grayling, whitefish, northern pike, sheefish and burbot. And that's just what you will find in the rivers and lakes! Saltwater species include the salmon as well, plus ling cod, halibut a plethora of rockfishes, several species of crab, three species of shrimp, abalone and enough variety of clams to keep everyone in chowder for years. If you love seafood, you won't go hungry in Alaska. Visit our species pages for more details! This site provides very solid information you need in order to plan your Alaska fishing trip. Whether it's a frenzied midnight run to take advantage of a hot salmon run, a weekend getaway on a local river, or an extended remote expedition on the saltwater or on a lake or river, you will find the resources you need to put it all together. Our Directory can point you to the commercial services you need: lodging, vehicle rental, boat rentals, guides and charter boat operators, tackle shops and much more. The Forums give you access to local folks who have used these companies and can tell you what to expect. Our Trip Planning pages provide an outline for your plan. It's all here. Our fishing forums offer an opportunity to interact with Alaskans who know the timing of our salmon runs, the best places to catch char, trout, grayling and other species at different times of the year, and the appropriate tackle and commercial operators to use for each species. The Alaska Fishing Forums give you the chance to ask questions, research productive fishing areas, and sit in on discussions between savvy Alaska anglers. There are literally hundreds of thousands of messages here about Alaska outdoors activities. The forums include Alaska Freshwater Fishing, Alaska Saltwater Fishing, Alaska Flyfishing, Alaska Ice Fishing, Alaska Fisheries Management, and Dipnetting, among others. Did you know that the Alaska Outdoors Supersite has an online store? We have the largest online collection of books, DVDs, and maps focused exclusively on the Alaska outdoors. Some of our most popular include Alaska Fishing, Flies for Alaska, Flyfishing Alaska, Alaska Atlas and Gazetteer, and more. "No questions asked" money back guarantee. Did You Know? 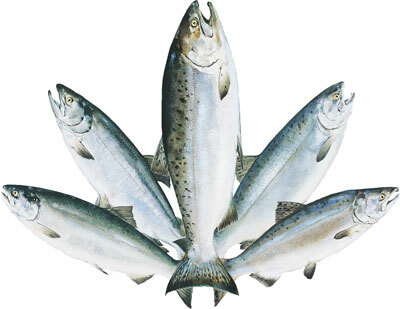 Each of Alaska's salmon species has two names. Learn them and you'll know what everyone is talking about! An extensive and up-to-date listing of hundreds of businesses that provide services for anglers. The directory includes Alaska fishing guides, Alaska air taxis, Alaska fishing lodges, boat rental companies, transporters, Alaska fishing charters, and more. Angling in Alaska can be incredible. Salmon runs are strong along our coasts, and there really are some giant halibut in Alaska waters. King salmon over 50 pounds are not at all uncommon. Grayling, rainbow trout and northern pike are easy to catch in many inland streams. And you can fish amid some of the most incredible scenery on the continent. To be sure, it’s not perfect. 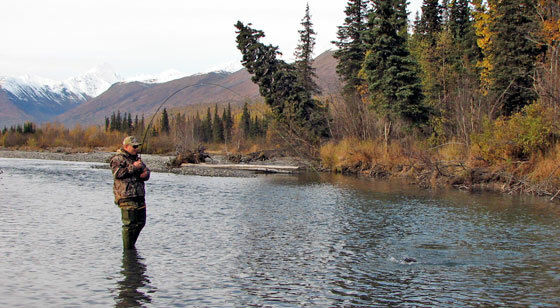 The productivity of most Alaska streams is not high in comparison with those in warmer climes. This means that some heavily fished streams do not quickly produce many large fish, particularly in the Interior. Large salmon runs compensate in many streams, however. For this introduction, we have divided the state into five regions: Southeast, Southcentral, and Interior, Arctic, and Western Alaska. Southeast Alaska, sometimes called the "panhandle," is a land of deep fjords, rushing mountain streams, old-growth forest, and glaciers. Most of the land is in the Tongass National Forest. Summers are cool and moist; winters are cooler and snowy, but much less cold than portions of Alaska not so warmed by the ocean. In the spring of the year (April-May), the season kicks off with steelhead runs in several southeast streams, with the peak of the run in most places occurring in mid May. It's not uncommon for anglers to encounter fish well in excess of thirty inches. Identifying productive steelhead streams is not difficult, and several books exist for that purpose. One of the best is Gunnar Pedersen and Rene Limeres's Alaska Fishing. This book covers the entire state in great detail, and a search for a good river should start with this resource, which also identifies the fly patterns and other terminal gear needed for each location. The Alaska Department of Fish and Game identifies over 300 streams in southeast Alaska that host runs of steelhead, so there are plenty of places to choose from. Some of the top producers are on Prince of Wales Island, and the Ketchikan area. By far the most well-known steelhead stream in Alaska is Yakutat's Situk River, where anglers congregate from around the world to float or bank-fish the river. In addition to the steelhead runs, Salmon return in large numbers to thousands of southeast streams. Halibut move into near shore waters in the summer. Several species of trout are available. A variety of bottom fish are available. Shrimp and crab can be found in some waters. Southcentral Alaska is home to most of the state’s population and some of the state’s most famous fishing areas. It includes coastal waters and watersheds from just east of the Copper River to Bristol Bay. Southcentral is a varied land and seascape. Trees cover much of the terrain east and north of Cook Inlet but are more sporadic or largely absent to the west. Mountains or rolling hills dominate the view in much of the area. The continent’s tallest mountain, McKinley (or Denali) is the tallest of many sentinel peaks along the divide between this region and the watersheds to the north and west. Summers range from cool and moist along the coast to warm and dry further inland. Salmon runs flood coastal waters and the larger rivers. The famous Kenai River is here. Halibut can be caught in most coastal areas, along with other ocean fish. Trout, pike, grayling, Dolly Varden, burbot, whitefish and other species are year-round residents in many watersheds. The Kuskokwim and Yukon rivers drain most of Interior, Arctic and Western AK. Western and Arctic Alaska is sparsely tree covered. Except for alpine and sub-alpine areas, most of the Interior is covered by trees. Distinct mountain ranges, rolling hills and wide river valleys and flats are the dominant landscape features. Summers along the coast are cool, and warm in the Interior. Salmon make long distance migrations up the Kuskokwim, Yukon and Tanana river drainages. Grayling are perhaps most widespread, but trout, pike, burbot, char, and sheefish are widely distributed and fished year `round. Sport Fishing regulations are available in five different booklets, each covering a different area of the state. These booklets are available widely in the state. You can obtain copies by mail from the regulations order page on the ADF&G web site. Being in the field with bears makes the outdoors much more interesting. Anglers are advised to keep their gear and fish with them at all times. That means you should wear a pack, and keep your lunch, your tackle and any fish you intend to keep in your pack. Bears are notorious for stealing fish and unattended backpacks! If you see a bear in the area where you are fishing, move away from the area while making plenty of noise, so the bear is aware of your presence. If possible, move to an area that offers good surrounding visibility. Bears do not always respond well to being surprised at close range. Pepper spray has shown some effectiveness with black bears, however it's been a mixed bag when it comes to brown / grizzly bears. This is discussed in greater detail elsewhere on the site, however anglers should be aware of it's limitations and conduct themselves accordingly. If you're camping in bear country, consider the use of an electric fence to protect your sleeping area, your food cache and your raft (for float trips). Bears often bite inflatable boats, but can be deterred if an electric fence is installed around the boat. Lethal methods of bear protection are legal in Alaska, but should be employed only as a last resort, by persons experienced in the use of firearms, who are accustomed to being in close proximity to bears, and who are carrying a weapon of sufficient caliber to kill a bear. Many bears are wounded or killed in Alaska every year because the shooter misunderstood the bear's intentions and panicked. A book that you may find helpful is Steve Herrero's Bear Attacks: Their Causes and Avoidance. Herrero is a biologist and one of the continent's best experts on this subject. The Alaska Department of Fish and Game maintains a trophy fish program. For some recent records and photographs see the Department's trophy gallery. We offer a many books, maps and DVDs that you should find helpful in planning your trip. Click to see our on-line Alaska fishing books catalog. In the past, the Alaska Outdoors Supersite had an online magazine, featuring fishing and hunting articles from around the state. We have kept the articles that are relevant to today's outdoor enthusiast, and you can find them in our Archives section.